Availability: In Stock. Next Day Delivery by FedEx. Fully insured delivery by FedEx - If your guitar pack arrives damaged or goes missing, we will send you another one -- no problem! We use FedEx Express 24 hour delivery service. Delivery is between 9am and 5pm Monday to Friday. All items are fully insured whilst in transit. We deliver to England, Wales, Scotland and Northern Ireland. If you are unsure about when an item will be delivered, please call the sales team on 020 8367 2080. Classenti guitar packs are warranted to be free from defects in materials and workmanship for 5 years from the date of purchase. If at anytime your Classenti guitar or amp malfunctions as a result of workmanship or faulty materials, we will repair or replace it. The Classenti warranty is extended to the original purchaser only and may not be transferred. The Classenti warranty is subject to the following limitations. Any guitar or amp that has been altered or modified in any way or upon which the serial number has been tampered. 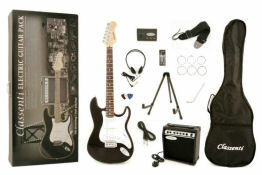 guitarsi.com offers a 30 day returns guarantee. If for any reason you are unhappy with your guitar pack you may return it to us (address below) in its original condition within 30 days of the date that you received the item and we will process a full refund of the price you paid for the item less carriage costs if applicable.